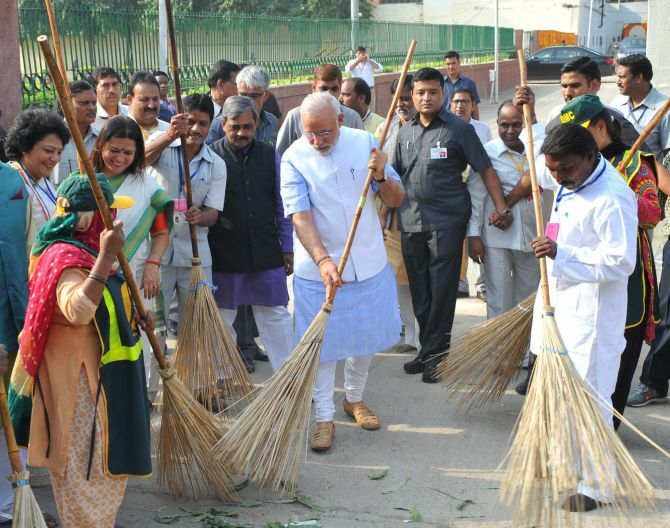 Wielding the broom, Prime Minister Narendra Modi on Thursday launched the country's biggest-ever cleanliness drive that is expected to cost over Rs 62,000 crore, asserting that the "Swachh Bharat" mission is "beyond politics" and inspired by patriotism. Debunking criticism that his government has been taking credit for every achievement, the Prime Minister acknowledged the efforts of all previous governments to make India clean. "I am not talking politics...this is beyond politics. This is inspired my patriotism not politics. We do not have to do with an eye on politics...I say that with a clean heart... If we paint this again with a brush of politics, we will again do a disservice to mother India. All the governments in this country have made one or the other effort to do this work. Several political, social and cultural organisations have made efforts in this direction. I greet all those, who have worked," Modi said in his 25-minute address at Rajpath, where he formally kicked off the five-year-long campaign that will cover 4,041 statutory towns. 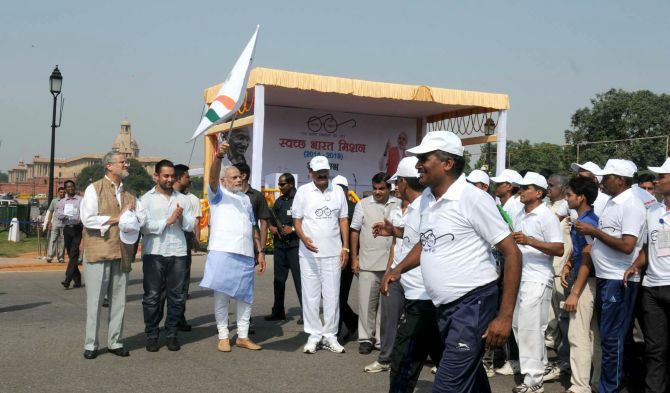 Administering a pledge to people to make India clean, he said that this task is not the responsibility only of safai karamcharis or the government but of all the 125 crore Indians. He said that today's campaign should not be seen as a mere photo opportunity. 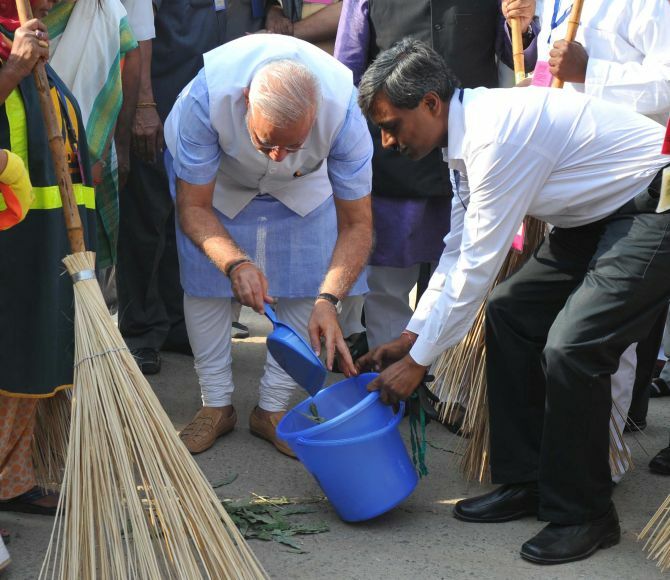 In an event marked by fervour and symbolism, the prime minister earlier wielded a broom and swept pavement in Valmiki Basti, a colony of sanitation workers here. The prime minister said that he is aware that the criticism of this programme will begin in just a few days but said he is prepared for this exuding confidence that the countrymen will not let him down. The urban component of the Mission is proposed to be implemented over 5 years starting from October 2, 2014, in all 4,041 statutory towns. The total expected cost of the programme is Rs 62,009 crore, out of which the proposed central assistance will be of Rs 14,623 crore. The Cabinet had last month decided to merge the 'Nirmal Bharat Abhiyan', a campaign for rural sanitation with Swachh Bharat Mission. The prime minister countered Congress criticism that his government behaves as if everything happened only after he came to power. "I do not make any claim that the government, which has been elected to power just now, has done everything." Congress has been attacking Modi accusing him of taking credit of initiatives undertaken by the UPA regimes and trying to give an impression that every good work was done only by him. Recalling that he had congratulated all governments even from the ramparts of Red Fort, Modi said," even today from this stage, I greet and salute all the governments--central, state and municipal, social organisations which have worked in this direction, whether they are leaders from Sarvodaya or workers of Seva Dal. I launch this programme with their blessings." Maintaining that everybody deserves kudos, the Prime Minister asked not to get into making political barbs on the issue. "Everybody before us has worked for it. Under Mahatma Gandhi's leadership, the Congress had led it...Who was successful, who was not. Let us not get into it who has done it, who has not. We should work responsibly," he said. While ruing that 60 percent of populace in rural areas still defecate in open, the prime minister said the stigma of women lacking toilet facilities has to be removed. Modi said that he has requested the corporates to evolve plans under corporate social responsibility to build clean toilets specially for girl students in schools. India, he said, should learn from foreign countries, where people are disciplined and do not litter in public places. He said though it is a difficult task, it can be achieved and for that people will have to change their habits. The prime minister said that a campaign has been unleashed on the social media as well where a separate website for the mission has been launched and he is tweeting about the drive on his Twitter handle. Expressing confidence that the nation can achieve the target of becoming one of cleanest in the world, the prime minister dwelt upon the low cost success of the Mars Orbiter Mission. "If people of India can reach Mars with minimal expenditure, why can they not keep their streets and colonies clean," he said asking people to take up the responsibility to make the mission a success. He also wondered whether the task can only be left only to the government to accomplish. "If we make it a public movement, we can make our country being counted as one among the cleanest nations," he said. The Prime Minister, who earlier in the day visited the 'samadhi' of Mahatma Gandhi and former Prime Minister Lal Bahadur Shastri on their birth anniversary, said while the countrymen launched a movement and achieved freedom realising one of the slogans of Father of the nation, there is now a need to fulfil his other vision of 'clean India'. He also chose the occasion to compliment two persons Anant from Maharashtra and Bhagyashree from Gujarat, who designed the logo of the campaign (Gandhi's spectacles) and the slogan "Ek Kadam Swachhata Ki Or" respectively. "I am seeing that Gandhi is looking through these specs that whether we have made India clean or not, what we have done and what we have done," he said. Quoting a WHO estimate, he said a person in India loses about Rs 6,500 per annum due to illness and poor health as he is unable to perform day-to-day duties. He said if the surroundings are kept clean, then people will remain healthy and such losses can be minimised.